THE RENOWN MONSTER COLLECTION BOX SET OF NINE CLASSIC CREATURE FEATURES + bonus BEHEMOTH THE SEAMONSTER (1959) stars Andre Morell & Gene Evans – Nuclear testing causes a dinosaur to surface and terrorise England. BEAST FROM HAUNTED CAVE (1959) Stars Michael Forest. Gold thieves pull off a heist only to be pursued by spider like monsters as they flee. GORGO (1961) with Bill Travers. Undersea volcano causes aquatic creatures to come out of hiding! MONSTER FROM GREEN HELL (1957) stars Jim Davis and Robert Griffin in a tale of giant wasps! THE GIANT GILA MONSTER (1959) stars Don Sullivan & Lisa Simone. A giant lizard terrorises a local Texas community and a heroic teenager tries to save the day. THE CRATER LAKE MONSTER (1977) stars Richard Cardella & Glen Roberts. In Crater Lake a scientist is informed of a remarkable discovery in the cave system! THE KILLER SHREWS (1959) stars James Best, Ingrid Goude and Ken Curtis. A doctors experiments mutate and become giant shrews that escape and reproduce rapidly. THE STRANGE WORLD OF PLANET X (1958) stars Forest Tucker. 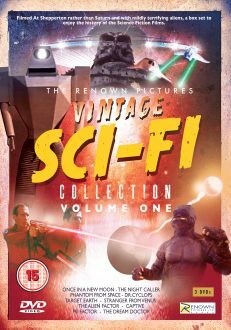 An alien spaceship warns of the dangers of a scientists experiments. THE WOMANEATER (1958) with Vera Day. In the Amazon a tree feeds on the blood of women! 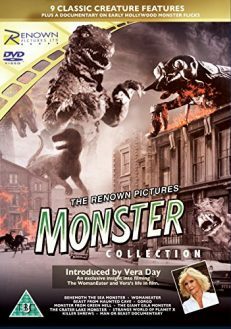 BONUS FEATURES: MAN OR BEAST – a short documentary on early Hollywood monster movies inc; Dr Jekyll & Mr Hyde, Hunchback of Notre Dame and Phantom of the Opera + VERA DAY – exclusive insight into her life in films and introduction to her movie THE WOMANEATER!